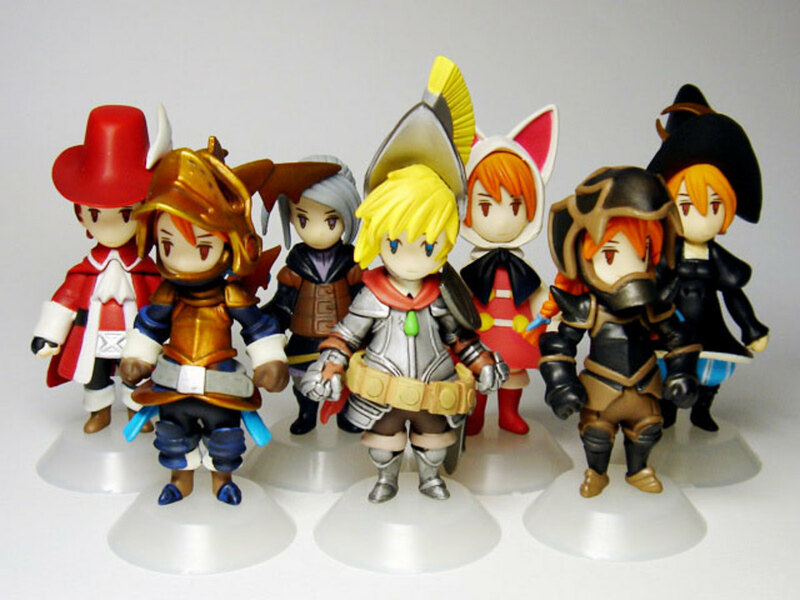 Final Fantasy Trading Arts Mini Figures: Watch Out for Counterfeits! Aigh! Someone just bought fake Final Fantasy Trading Arts minis from an eBay ad on one of my pages! * Let me show you how to tell fake Square-Enix Trading Arts figures from real ones, so you don't make the same mistake. My method isn't fullproof: there's no guarantees when you buy something online. But this way you'll be able to spot obvious Chinese counterfeits. 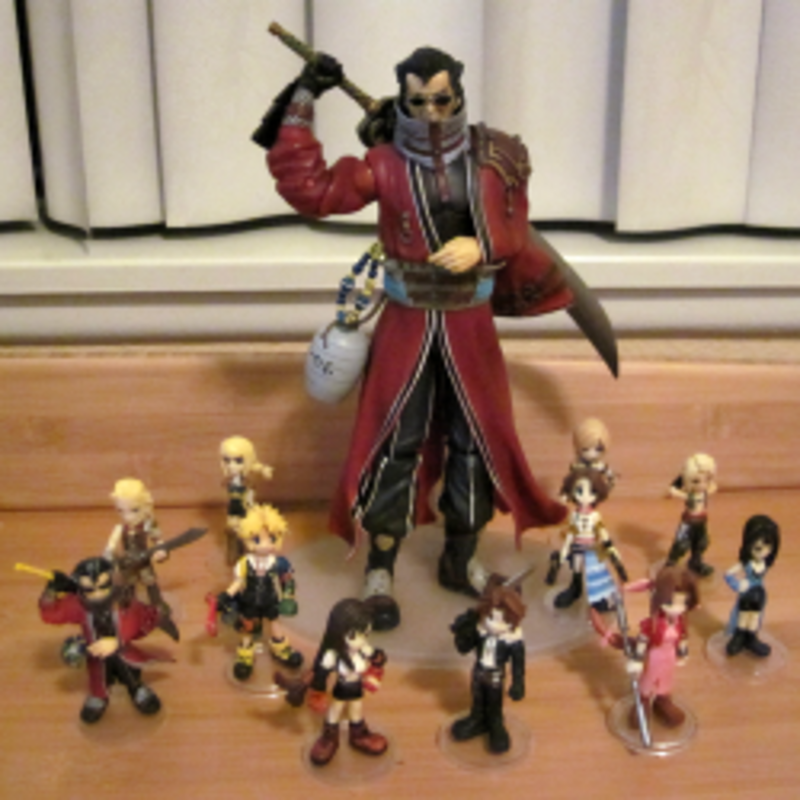 Left: Photo of my Auron Play Arts Figure surrounded by my collection of Trading Arts Mini Figures. Final Fantasy character designs are © Square-Enix. *I can see what was bought, but not by whom. I earn a few pennies of commission from items bought through my pages, but I'm a fan, and I don't want fellow fans getting ripped off! 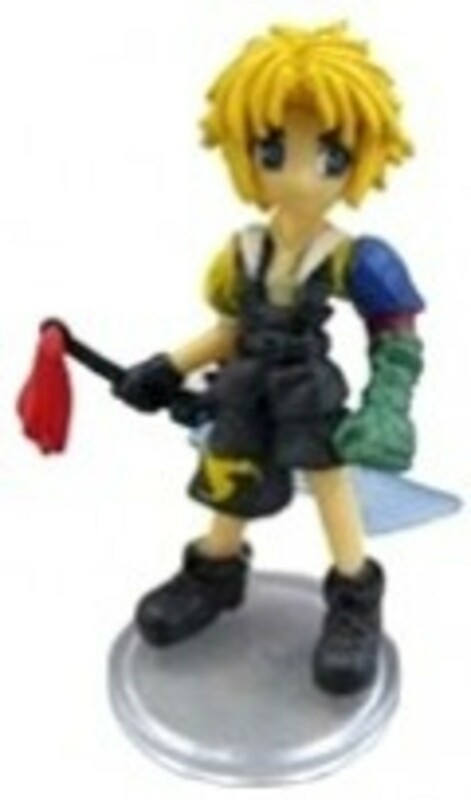 So here's Tidus as a Final Fantasy Tradin Arts Mini figure. Ain't he cute? (I resist the urge to show mini Auron for this demo.) The eyes on these figures are adorable, the likenesses are superb in miniature, and tiny details like zippers (of course, it's a Nomura design), jewelry and stripes are picked out with exacting detail. Some even have hair highlights! Amazingly, this photo is larger than the actual figure, which is only two inches tall. 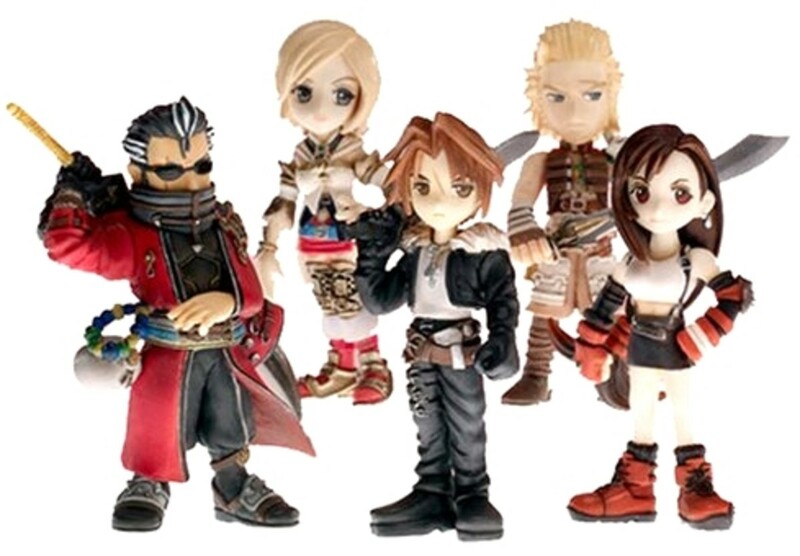 Final Fantasy Trading Arts Mini figures were originally released in "blind boxes": you didn't know which figure was inside! Hence "trading arts": Japanese Final Fantasy fans collect and trade them. After a while, they are re-released in boxed sets: Vol. 1, Vol. 2 and so on. 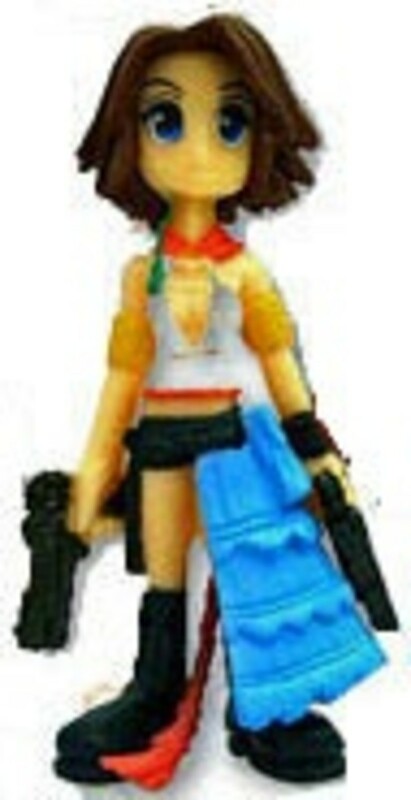 The boxed sets often contain a "bonus" secret figure, like Rikku from FFX-2. Sorry for ugly image, but this is about the best you'll get with these boogers. Unfortunately, because these figures are tiny (barely over 2" tall) and all of one piece, they're much easier to counterfeit than the large, jointed Final Fantasy Play Arts Action Figures. 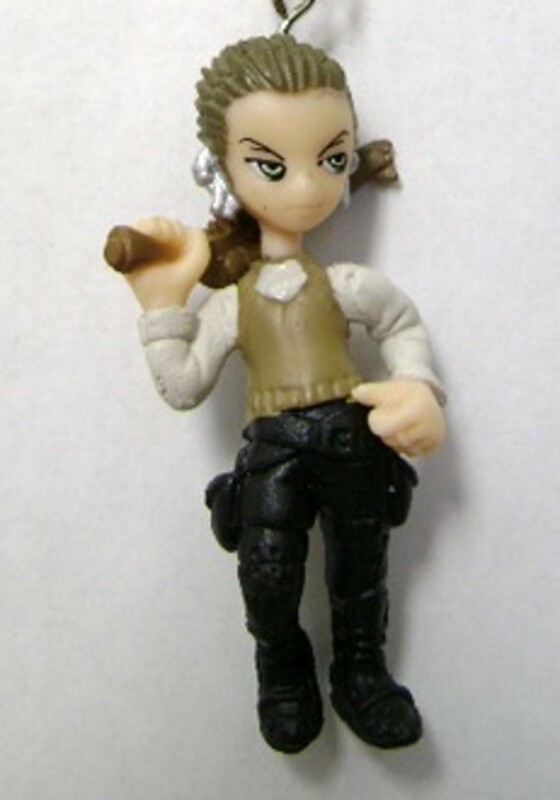 I'm guessing that counterfeits are cast off originals so the details are just a little rougher, and pieces like Aerith's staff and Balthier's gun tend to be bent. Fake Trading Arts mini figures often don't fit in their bases. Worst of all, their paint jobs are far less detailed and accurate than the original. 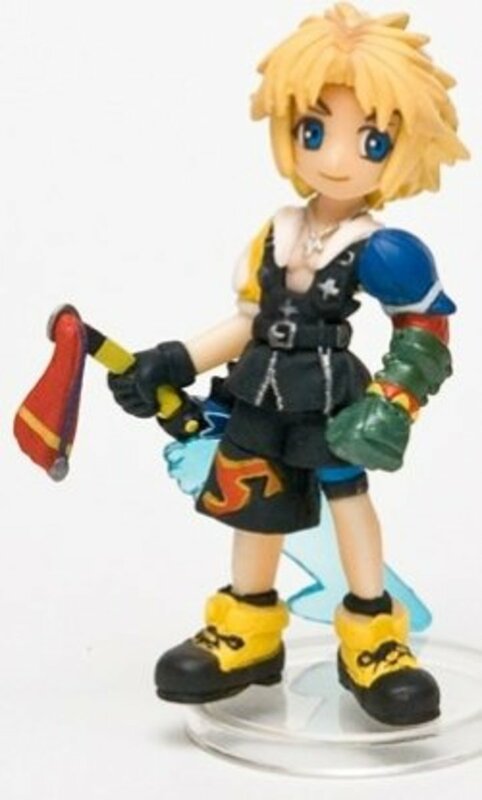 Here's a Tidus figure I found for sale on eBay. eBay listings seldom have high-quality photos, but even this photo shows some telltales. Notice the details, especially the red "Zanarkand Abes" symbol on his pants leg-- whoops! 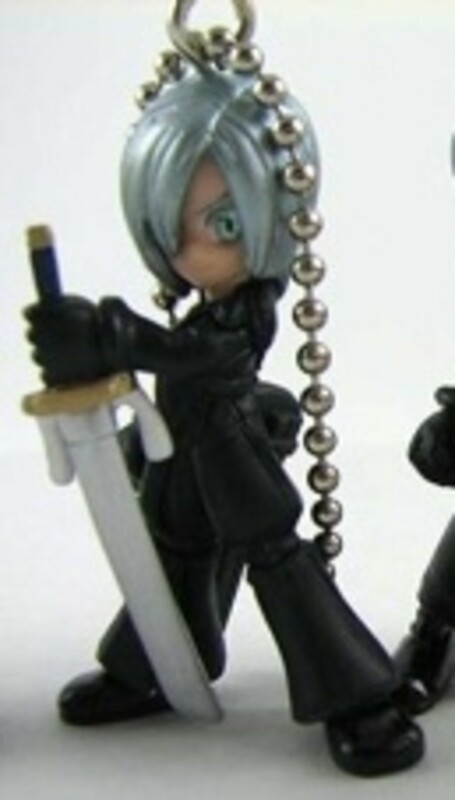 The more you look, the more you see: no stripe on the sword pommel's tassel, no bracelet, no zippers (designer Tetsyuo Nomura would have a coronary), no yellow shoes. Pay attention to reviews and seller ratings. Buy in boxed sets with names like Vol. 1, 2, 3 (see below: I'll show which figures are in each set.) It's more expensive, but a little safer than buying "loose" figures. HOWEVER, watch out: if it says "Blind Box," it's probably just one figure from that series! 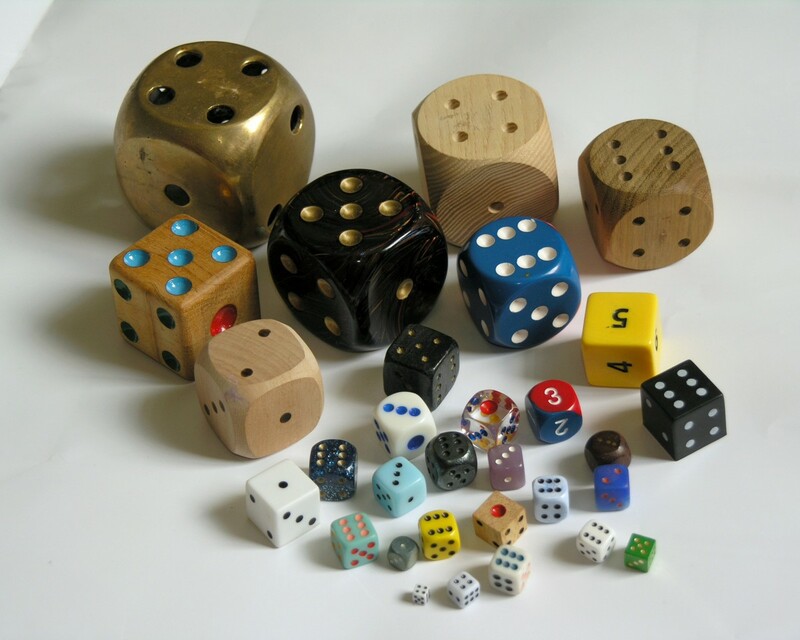 AVOID any boxed set of ten. 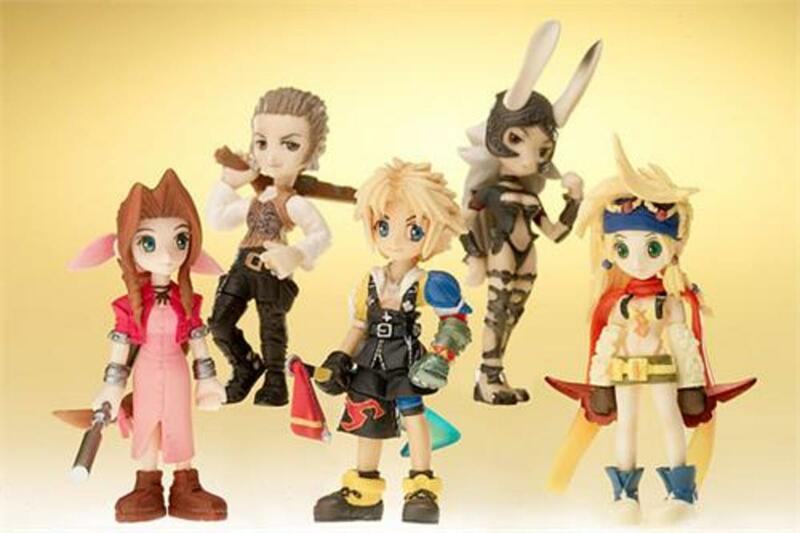 Final Fantasy Trading Arts Mini figures were never sold that way by Square-Enix, and that seems to be the most common way the fakes are sold. Don't be shy about asking a seller to snap a photo of the figure on his/her desk to help prove the figure is legit (although the seller may ignore you). If you can get what looks like a personal rather than official photo, you can use Tineye.com to see if the photo is posted anywhere else. If it is, it make be a fake. 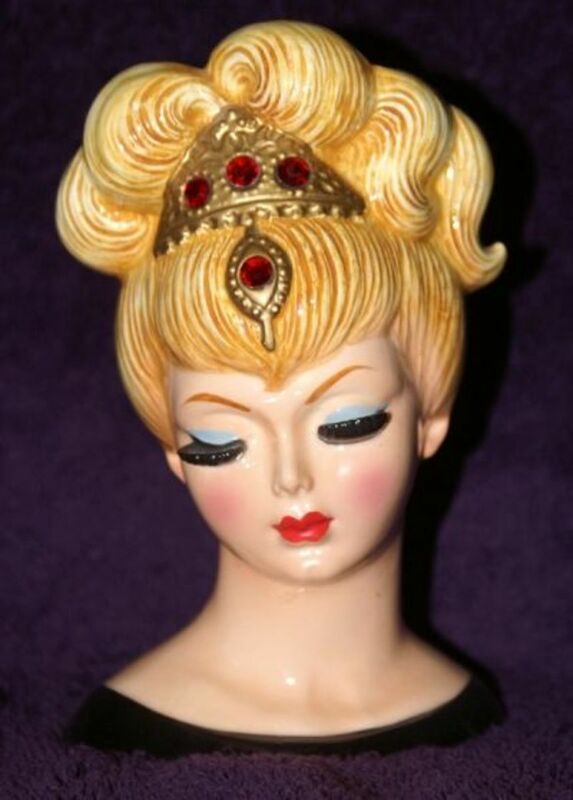 Apologies for poor-quality image ganked from an eBay listing, but then, it's a poor-quality knock-off. Here we go. If you see a "set of 4" boxed set, Penelo's not in it; try to find "set of 5" to get her. I've got all of these except Cloud (wah!) The easiest way to spot a fake in this set is to check Yuna's skirt: on the counterfeit, it's painted a solid light blue with no white shading. Also, if you can see the tip of her insanely long ponytail, the tip down by her feet should be brown, not red. Fake Vaan also loses the detailing on the sides of his hips and thighs, as well as his pectoral (chest necklace). I've set this widget to search for "final fantasy mini vol 1" with a few qualifiers to keep out wrong results, but you never know how people will label their sales. Also, this is liable to turn up single figures from the boxed sets. So take a look here for bargains, but be careful and follow my tips above. This is actually how I picked up Vol 1 and 2. I found an honest seller with them packed in their original baggies, but not the boxes, so I got all ten. They are the real deal. I can ONLY find the "Blind Box" for Final Fantasy Trading Arts Vol. 3 on Amazon, and all the listings are third party sellers. "Blind Box" means one random figure from this set of five. Check eBay. I've set the search for this widget to look for "final fantasy mini 2 -kai -ffii -ff2" eBay listings. Look for the different-colored beads on Auron's jug of nog, or the stripe on Tifa's gloves. The fake listings I've seen are missing those details. Rikku is really, really hard to find. This is also one of the easiest batches for which to spot fakes. I've already shown you the fake Tidus above, with the yellow "Abes" symbol on his pants and lack of yellow shoes. Also, fake Balthier's cuirass (armored vest) has zero detail, and his belt buckle is conspicuously absent. I just love Balthier and Fran. It's their Revenant Wings look! 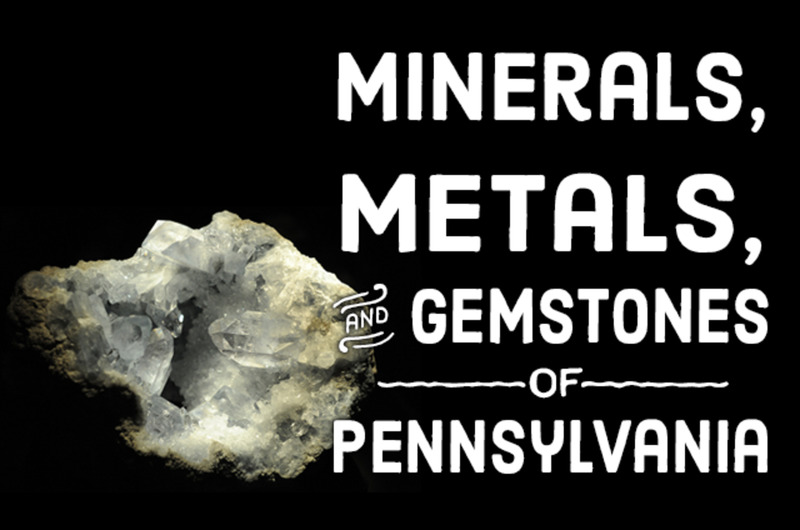 Click the large-size image above for several good detailed photos of these. This may be the only way to find Rikku. As usual, watch out for fakes. If you can't see her yellow braids falling in two u-shaped loops over her blue headband, it's a knockoff. Japan Exclusive: Yuna FFX (original Yuna, beautiful detailing) Again, Amazon listing does NOT show Yuna; check with third party seller to see if it's "Set of 4" or "set of 5"
I haven't seen fakes on these, but I'd guess that they skip painting the white hyacinth pattern on Yuna's skirt. I still need to add all of these (or at least Yuna and Sephiroth) to my collection. By the way, check out this great close-up by collector Manveri. He/she has good photos of all the Trading Arts mini figs. Zidane, Sephiroth, Yuna — they all really come to life when you see them up close. 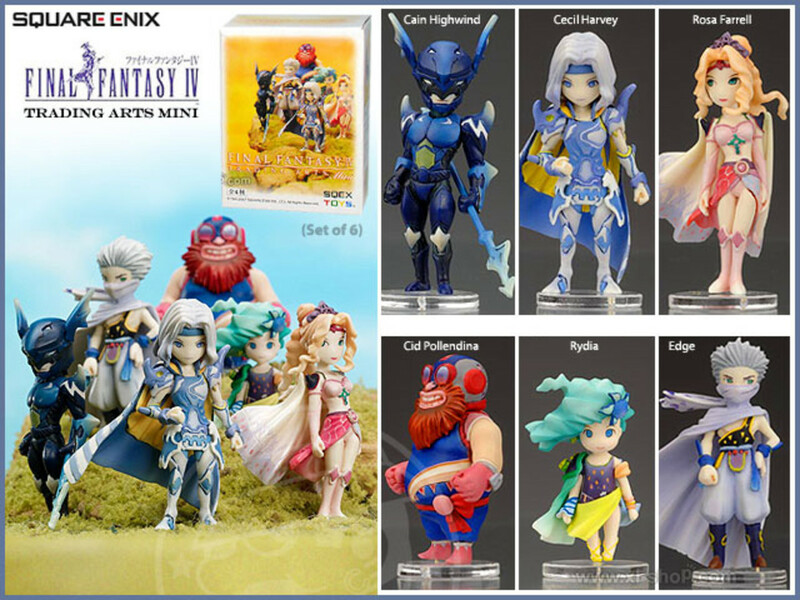 The FFIII and FFIV Trading Arts Figures are based the 3D remakes of these games, which I played on iOS; I think they originally were released on Nintendo 3DS. These aren't on Amazon, but sometimes turn up on eBay. I'm guessing you're fairly safe from fakes; it's the more popular characters like Cloud, Yuna, Balthier, Tidus and Squall that get counterfeited. Good to see Refia the blacksmith's apprentice gets a lot of the limelight— she's snarky and smart and my favorite character from the remake. Unfortunately, her Dark Knight and Magus figures don't come in the usual boxed set; they were Japan exclusives (found in blind boxes), so they're rare. I'm afraid I don't know any of these little floofs besides Shantotto, hilariously voiced by Candi Milo (Lucil, Lady Dona and Pacce in Final Fantasy X). Again, if you go to eBay and search for "Final Fantasy XI mini set," you may find all of them; for some reason my widget's being cranky. 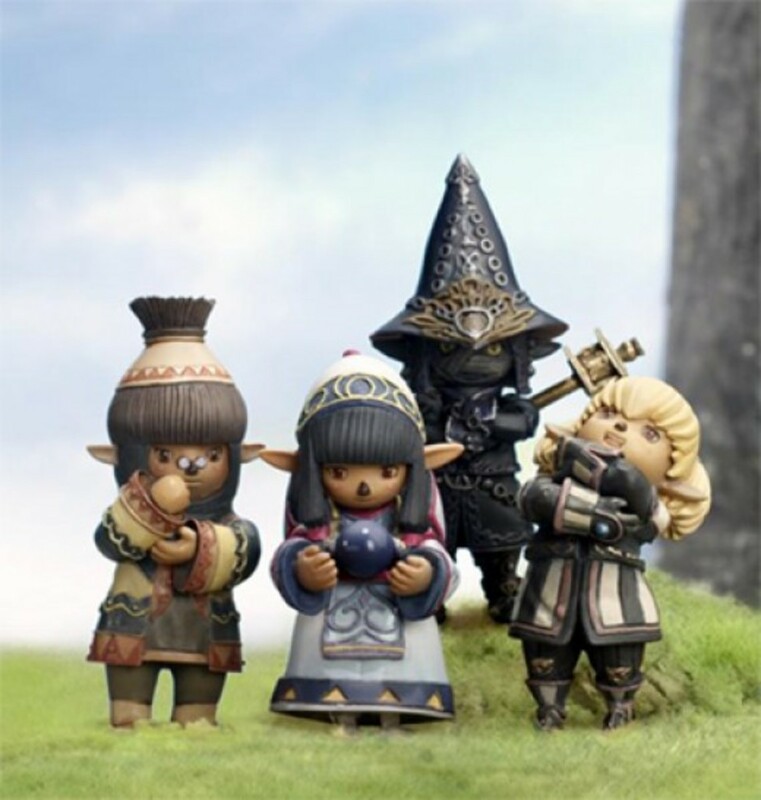 There are several "Bandai" Mini Final Fantasy figures which are not exactly fake, in that it's a real Japanese company imitating Square-Enix toys, but they're not licensed and official Square-Enix products. And some are copies of Trading Arts Minis with poorer paint jobs. 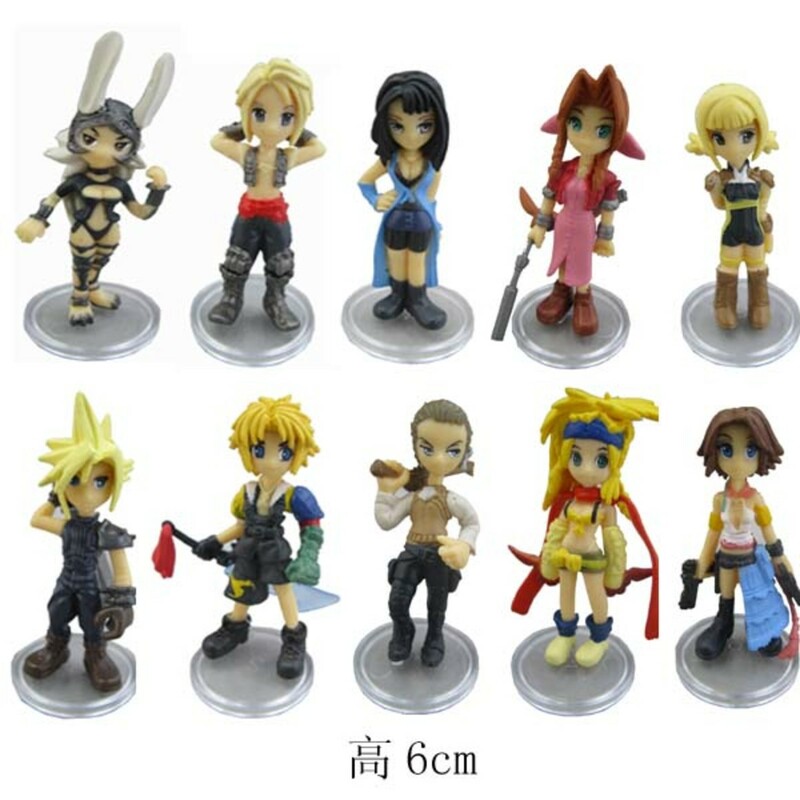 On the other hand, Bandai has supplemented the "official" line of Final Fantasy Trading Arts Mini figures with Kadaj, Loz, Yazoo, Cloud and Tifa in Advent Children outfits, Nooj and Paine from FFX-2. 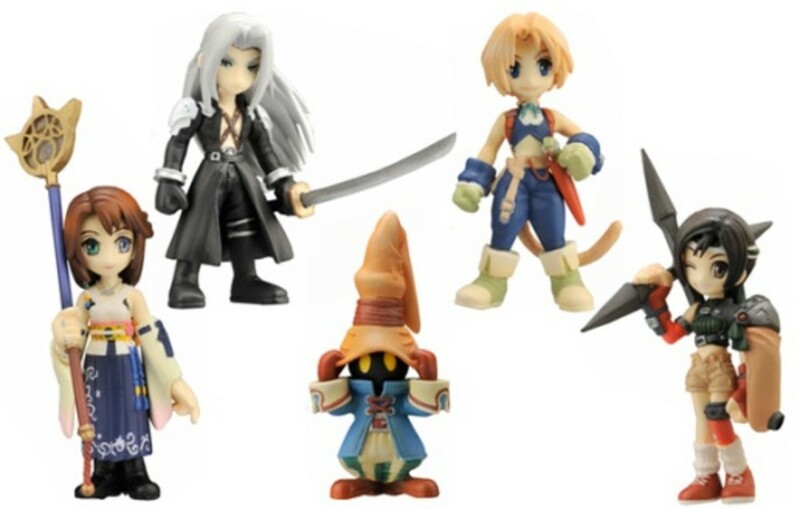 The Bandai figures are actually the source of most of the "Final Fantasy Mini" keychains. Some are pretty cute, even if the quality isn't quite as good as the official Trading Arts minis. 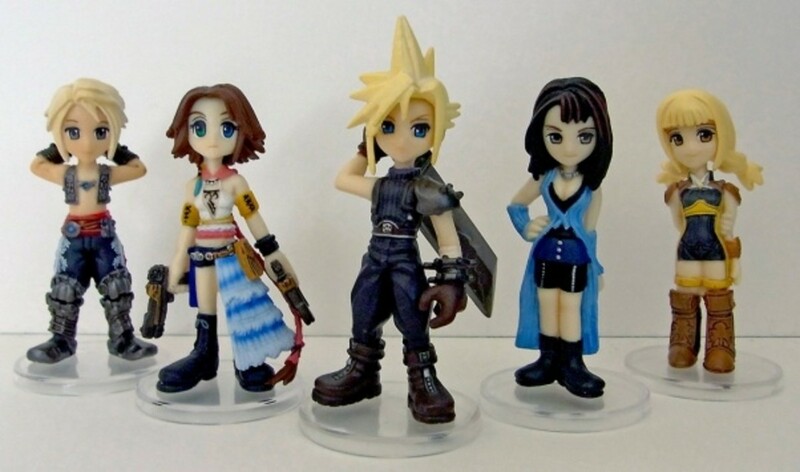 I've seen Advent Children Loz, Yazoo, Kadaj, Cloud, Tifa keychains for sale at various times — I think they're all Bandai. I appreciate you creating this because I was about to begin a collection of these figurines based off of some I received from Christmas last year, only to realize the 10 I have are all counterfeits. I'll be back to make sure I do not get anymore counterfeits so consider this page bookmarked :). Like the last comment, I would not have found this if it was not the first thing that came up on Google when I searched for these figurines. My email is katran (at) cox (dot) net, if you want to email them... or whatever you like! Also, would you like an image credit and/or link back to your site? Great article - it has been really useful for me when purchasing these figure sets. I bought Volume 1 boxed from a reputable retailer when it originally came out and loved the figures but to buy the boxed sets now are pretty expensive. Prior to reading this blog, I bought a cheap 10 figure ""fake" set from ebay out of curiosity, to see if the quality was up to scratch - I can assure you its not. I have a fake and real copy of each character in volume 1 (Vaan, Cloud, FFX-2 Yuna and Rinoa) and can provide photos of them side by side for your blog if you like - it'll really highlight the differences. What I will say, is that the bootleggers appear to have obtained original moulds for series 1 and 3 - the plastic they use doesn't seem to be as durable (hence the droopy weapons on some characters) but otherwise the plastic is identical, the hairstyles etc. are all exactly the same. It's just the paint jobs that are different, but this is really noticeable. The skin tone on the fakes is orangy, the yellow used for blonde hair is quite garish and much of the smaller painted detail is missing. Anyway, I'll check back here - let me know if you want some comparative photographs to put up. Your page appears on page 1 of Google Ranking when searching for Final Fantasy Trading Arts, so I'm sure you are helping out lots of people!